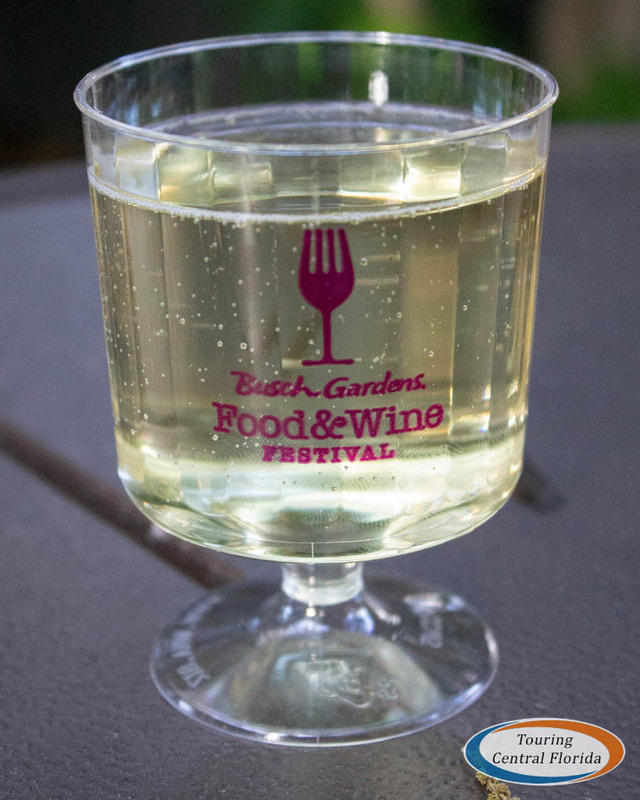 The 5th Annual Busch Gardens Tampa Bay Food & Wine Festival is now underway, running each Saturday and Sunday (plus Friday, April 19) from noon until close through April 28, 2019. 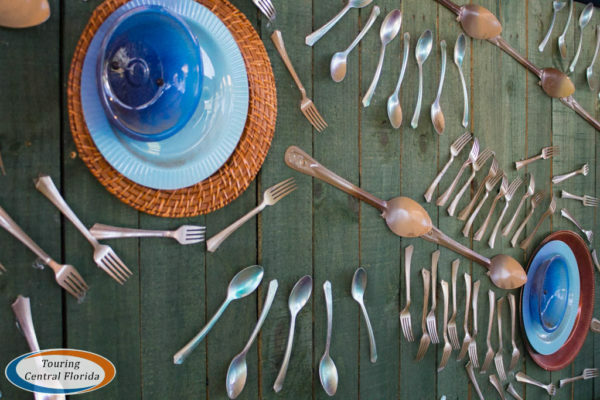 The event combines over three dozen sample sized culinary creations, over 100 different wines and craft brews, headline concerts and other entertainment. In this guide, we take a look at all of the wine, beer and cocktail choices available. In the interest of full disclosure, some of the items we tried below were purchased using a sampler lanyard the park provided at a media preview of the event. Others were purchased out of our own pocket. As always, all opinions are our own. While we’ve attempted to provide the most accurate information possible, all of the details, pricing and item availability are subject to change without notice. Last update: 4/4/2019. Available for purchase at any of the festival cabins, the Sampler Lanyards can save you money if you’re planning on purchasing multiple items. The best part is the lanyards can be shared among your party, and are good throughout the duration of the festival, so no need to buy one for every person or feel you need to use all the punches in one visit. There are three price points for the lanyards – $29.99 for a five-item lanyard, $39.99 for an eight-item lanyard, and $54.99 for a 12-item lanyard. Annual pass members can also get a special 15-item lanyard for the price of a 12-item lanyard, but no further discount applies. The pass member discount applies to the 5 and 8-item lanyards. The lanyards are valid at every booth for every food and alcoholic beverage item. 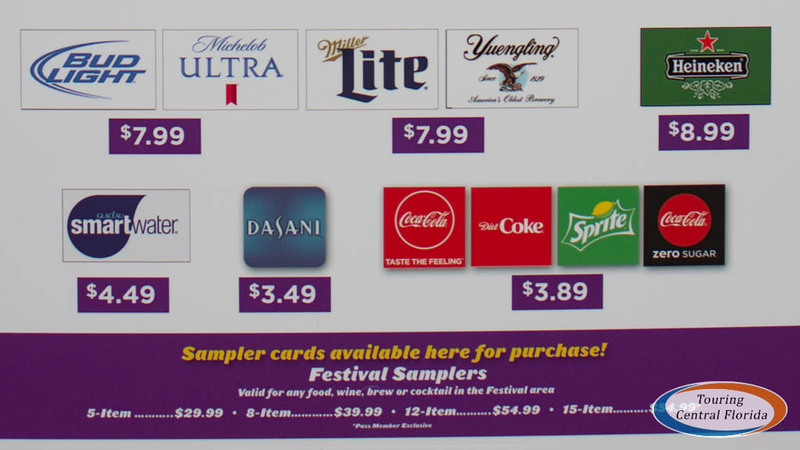 How much you can save will vary depending on which lanyard you purchase and what items you choose, but even at $30 for the 5-item lanyard (that breaks down to $6 per item), with alcoholic drink prices starting at $8.50, you’ll save over $10 compared to paying out of pocket for five drinks. 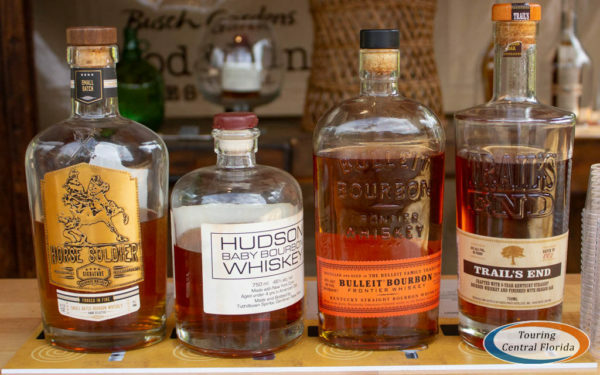 There are more than a dozen “Libation Stations” across the festival area, plus 5 special tasting bars where you can sample different varieties of wine, bourbon, tequila & vodka. 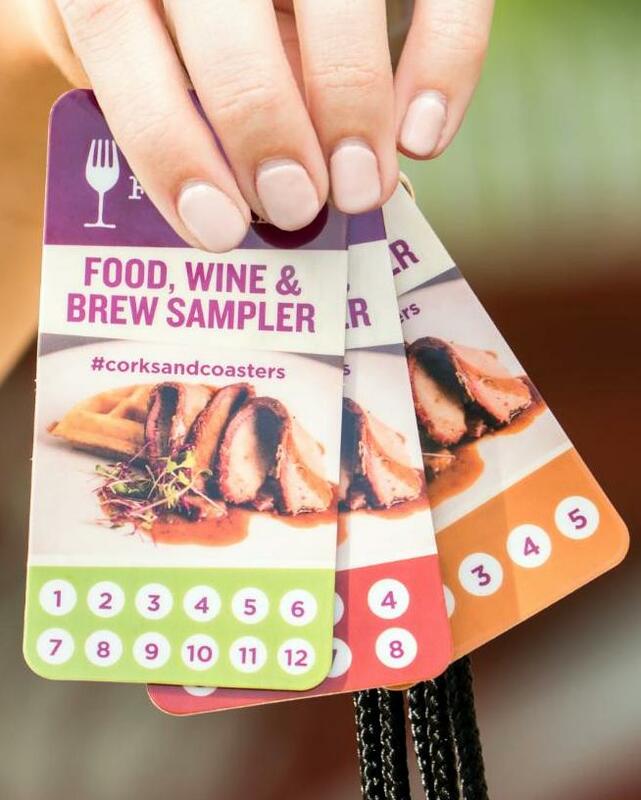 Many of the stations feature one or more wineries and breweries, and some of the food cabins also have a wine, beer or cocktail pairing on their menus. 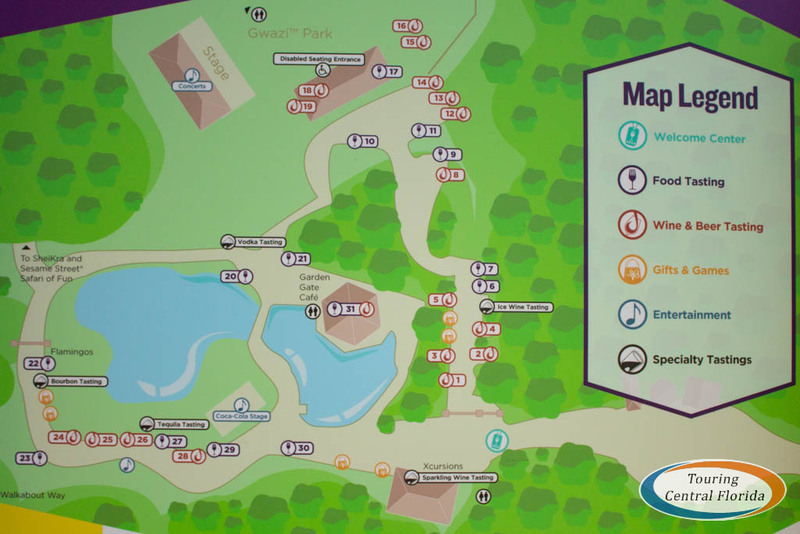 Be sure to pick up a Festival Guide when you enter the park or from the Festival Welcome Center located just outside the Gwazi Park gates. The Libation Stations are listed in numerical order in our guide below. There are a total of 15 libation stations that feature just wine, craft beer & cocktail selections. Each station has a couple of wineries and/or breweries featured. Pricing is standardized across all of the beverage cabins – you’ll find wine & cocktails available for $8.50 a glass, and the craft beers at $8.99 a glass. If you’re using a Sampler Lanyard, it’s one punch per drink. 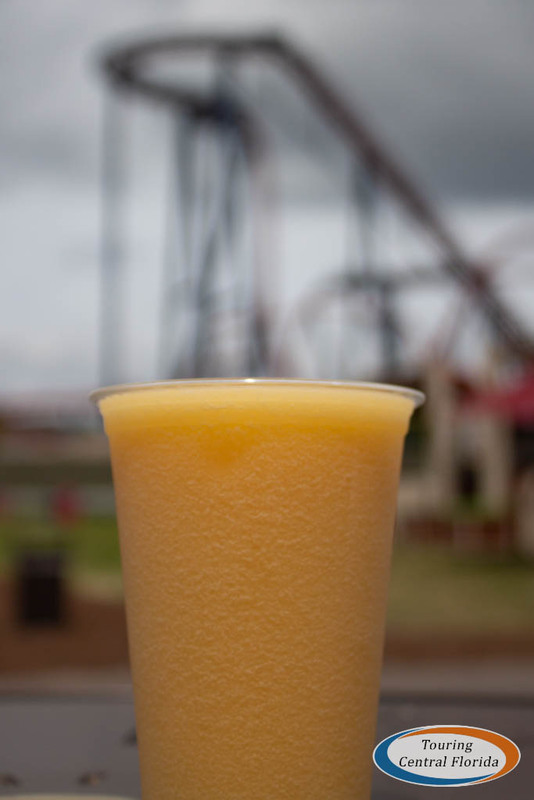 Below is the Frozen Peach Bellini, with Gwazi Field and SheiKra in the background. On a hot afternoon, it was very refreshing, with a sweet peachy flavor and a fair amount of alcohol. 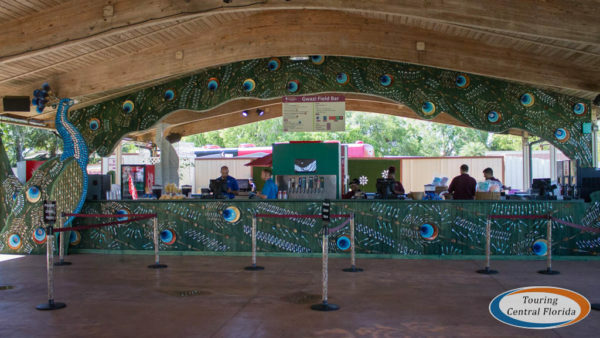 Located next to the concert area, the Peacock & VIP Bar serves up a variety of drinks and light snacks. The VIP Bar is exclusively available to those guests who have a VIP Seating package for that evening’s concert. The menu and pricing is the same at both the Peacock and VIP bar. Just like the other booths, a Sampler Lanyard can be used for the alcoholic drinks, or you can pay out of pocket. For complete menus, pricing, and reviews of items we tried, be sure to check out our Food Guide as well. 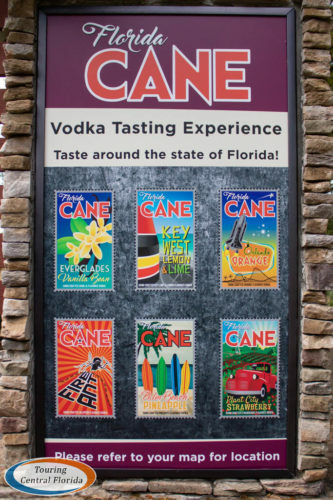 Only those food cabins with a featured alcoholic beverage are listed below. 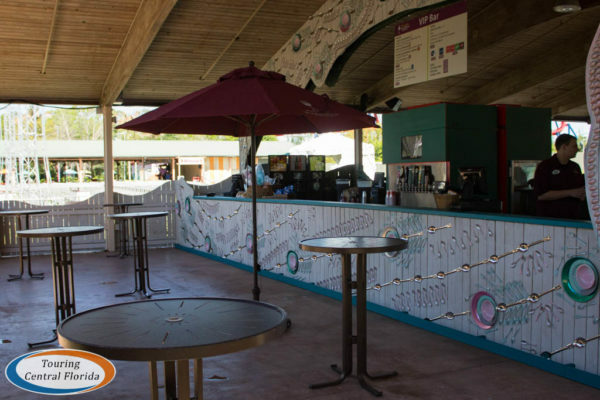 In addition to all the individual wine, beer and cocktail options at all the different cabins, there are also five additional specialty tasting bars scattered around the festival area. Each individual tasting is $27.99. 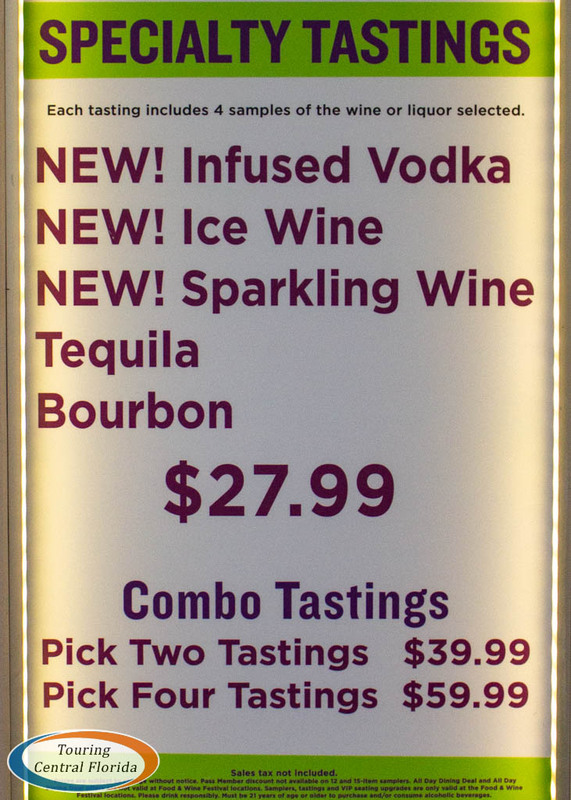 There are also combo package options available if you’d like to try more than one tasting. Guests can choose from packages for two ($39.99) or four ($59.99) tastings. 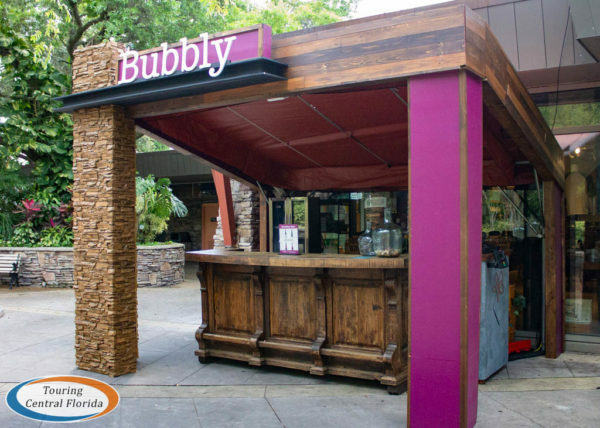 The Sparkling Wine Tasting is located at the booth named Bubbly, just outside of Xcursions gift shop near the entrance to the festival walkway. 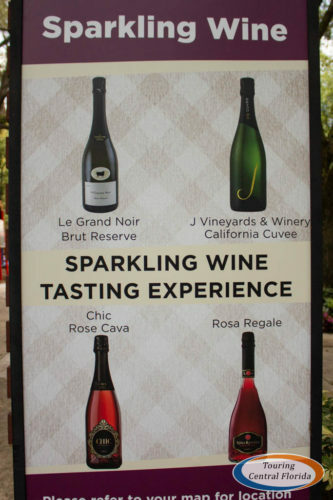 Here you can sample Le Grand Noir Brut Reserve, J Vineyards & Winery California Cuvee, Chic Rose Cava, and Rosa Regale. One of the new tastings this year, guests will find the Ice Wine booth along the main festival walkway heading towards Gwazi Field. There are four wines to sample at this tasting booth. 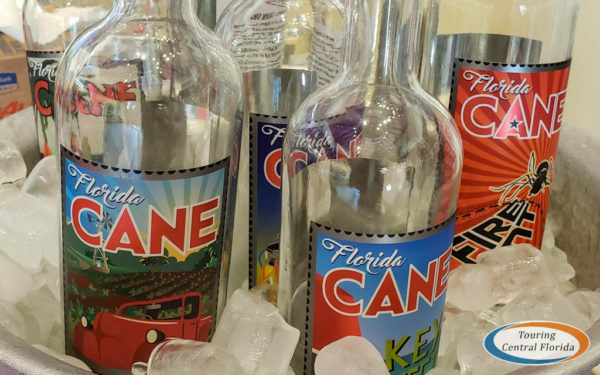 Six different flavor infused varieties of vodka from Tampa based Florida Cane Distillery are available in a new tasting experience at this year’s event. Guests can choose from vanilla, orange, pineapple, strawberry, jalapeno, or key lime & lemon. 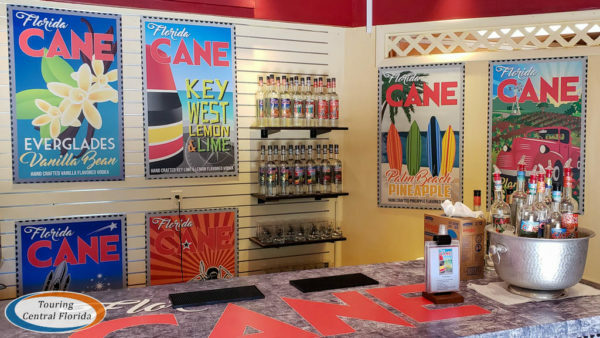 Look for the tasting inside the 60th Celebration Store on the corner across from the Vivi’s Kitchen and Tampa Tavern booths. A tasting includes your choice of four varieties, each a 1/2 ounce pour. 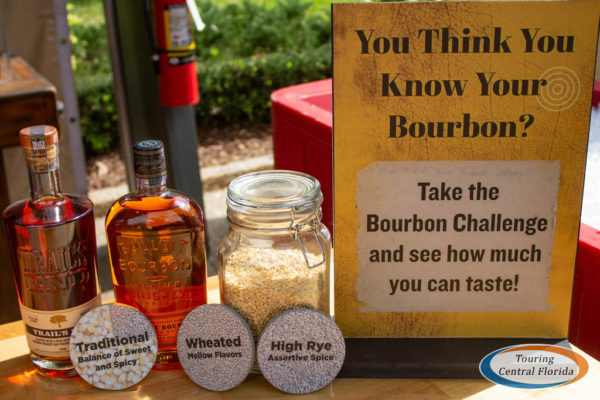 Four different bourbons are available at the tasting booth along the pathway near the kangaroo habitat. 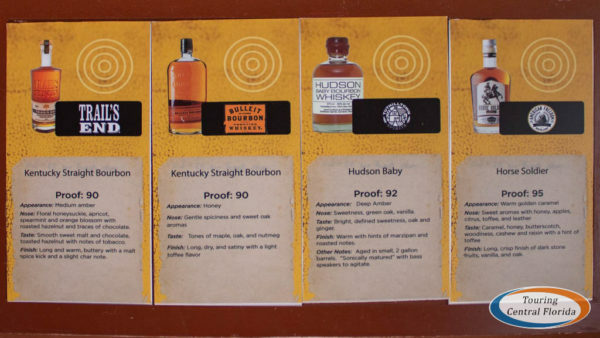 Cards for each of the different bourbons tells you a little bit about the flavors you should expect to taste from each variety. 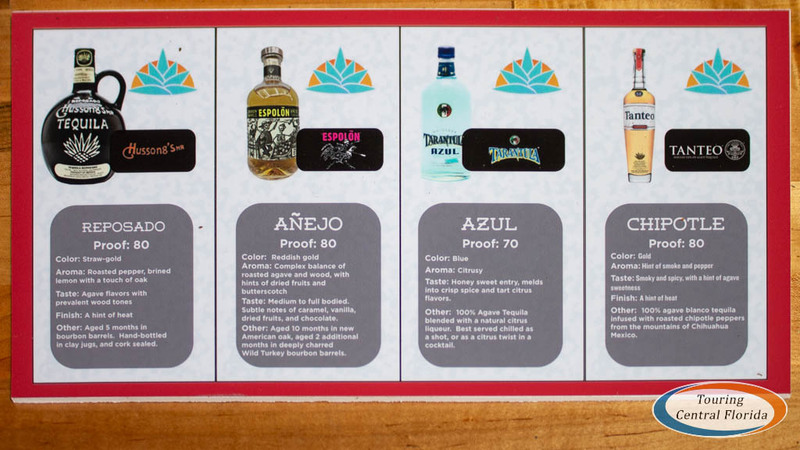 Like the bourbon tasting nearby, there are four tequila tastings, and cards on the counter explain the flavor profile and distillery process for each variety. Get a sampler lanyard. If you’re planning on eating or drinking more than a handful of items, get a lanyard, especially if you’ll be visiting multiple times during the festival. Stick to the higher price items, and you’ll be saving a good chunk of change versus buying each item separately. Plus, no need to keep digging in your pocket or purse for money or a credit card at each booth. Ask for a taste. If you’re not sure if you’d like a particular wine, cocktail or beer at the Libation Stations, you may be able to get a small sample at no charge so you can make the right decision. This may not always be available, but it doesn’t hurt to ask if you’re on the fence about a particular drink. Pace yourself. With so many alcoholic options readily available, it’s easy to overindulge. Remember to drink plenty of water (especially if it’s hot out) and enjoy some of the food options in between drinks. And most importantly – don’t drink & drive! See our other guides. 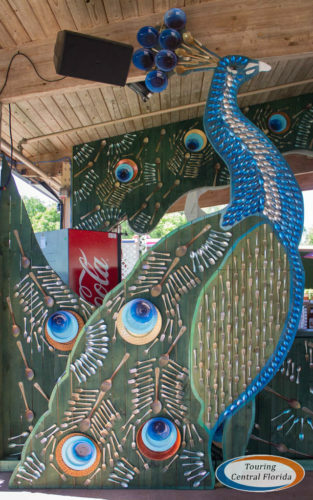 For even more information and tips, check out our overall Festival Guide and our Food Guide with menus, prices, and reviews of items we’ve tried.